Over the last 18 months we have worked with Public Health at Blackpool Council and the Blackpool Clinical Commissioning Group to design and deliver four Citizens Inquiries on health and wellbeing. The launch event for the Central East Inquiry took place in early May and brought together agencies and Inquiry participants to hear about the ideas and recommendations which the Inquiry group believe can improve health and well-being and to begin to identify agency response, future community action by residents and greater resident’s influence in policy-making. 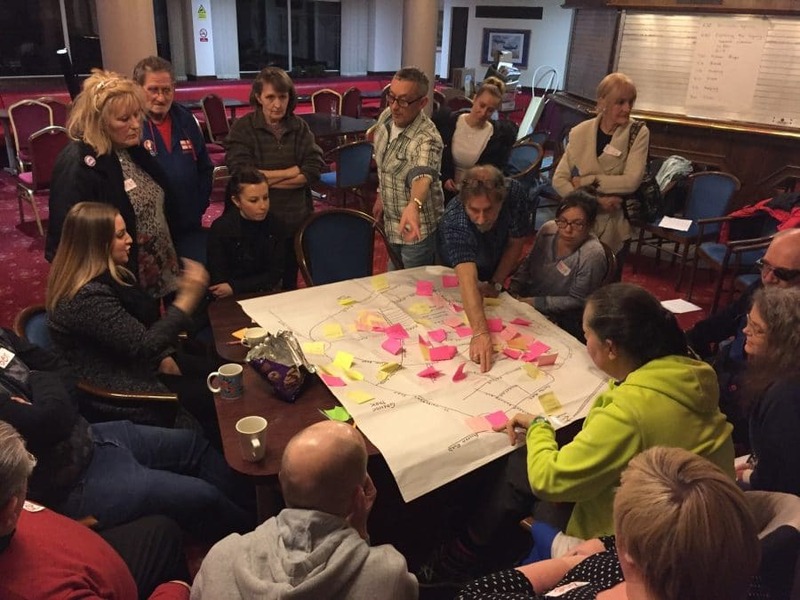 Some 35 people took part in the event in the community centre at The Grange at Grange Park, facilitated by Pete Bryant and Nick Beddow from Shared Future. The group met on Thursdays from February to April 2018. Each of the sessions lasted some two and a half hours. During these informal and relaxed sessions a diverse group of local residents were encouraged to think and talk about well-being and health in their neighbourhood. A number of experts (‘commentators’) were invited to come and speak at some of the sessions to add knowledge and to help them explore how things could be changed. One of the participants from the Blackpool Central East (Layton) Health and Wellbeing Inquiry. Following an in-depth grilling of the commentators the group decided upon the recommendations they wanted to put forward and prioritised them using a voting system. All recommendations, irrespective of the number of votes received, were included. We would like to say a huge thank you to the members of the Citizens Inquiry, who placed their trust in the process and us as facilitators. This diverse, inspiring group of local people came together week after week to share their opinions and experiences with each other and us in the hope that their efforts, openness and commitment might make a difference to their own communities.